Bad to Fair Credit Recommended (300-670) ? CreditCards.com credit ranges are a variation of FICO® Score 8, one of many types of credit scores lenders may use when considering your credit card application. ? Application response in as little as 30 seconds. If approved, fund your Security Deposit to open your account. Once open, you will have the opportunity to build your credit limit up to $5,000. Quarterly FICO score on your monthly billing statement. Zero fraud liability protects you from unauthorized charges. Restrictions apply. If approved, your First PREMIER Bank credit card account is reported to the Consumer Reporting Agencies each month. 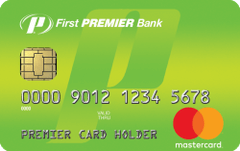 Our take: Though it does not offer any rewards and comes with an annual fee, the First PREMIER Bank Secured credit card is still a decent option for those with lower credit scores looking for a good APR.